As wooden product manufacturer, we so proud to introduce you our collections. We have indoors and outdoors decorations, chess pieces, giant chess, wooden stone, wooden trophy, and many more. All of our products are made of Teak wood and carved by professional craftsman from Java island, which is famous of its good Teak wood and talented craftsman. We sure that you will satisfied to buy our product because it handmade product and unique one. 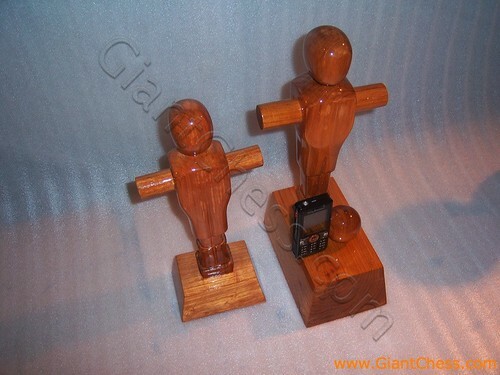 Here we introduce you wooden trophy in soccer man design. This trophy is handcarved that made of Teak wood. Very unique and different. It suit for reward of local football champion, a gift for your friend or family, house decoration, your children room decoration, etc. Carved in unique design and painted in natural wood, give different touch for your house. You can lay it on your living room table or other place to dressing your room.